The outer layer of our skin is technically a lipophilic barrier that has a double role- it controls moisture loss from the deeper layers and at the same time it protects us against external factors that may influence our health. Appropriate skin care is necessary and vital. But, is it really possible to achieve that without exposing our skin to all those chemicals found in beauty products? Olive oil relieves, rejuvenates, hydrates and makes your skin silky smooth. Additionally, it prevents the appearance of wrinkles and other signs of aging. 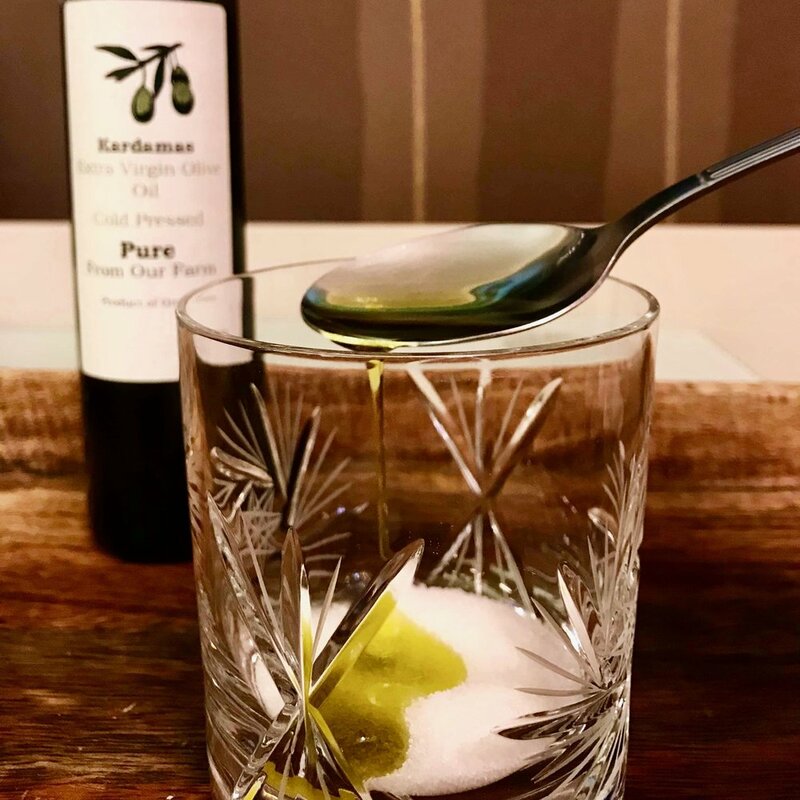 Use our Kardamas Extra Virgin Olive Oil in simple DIY recipes! Probably the sweeter exfoliant you have ever tried! Just combine these two simple ingredients and make a paste. Apply it on your face and massage smoothly. It will remove excess oil, dead skin cells and dirt that clog your skin pores. The same scrub will also work excellent for your body. You’re just going to have to make some more. I use it on both my face and body and the results are just amazing! Mix up the ingredients and gently spread it over the face and neck. Leave it on for 15-30 minutes (or more) and then rinse with lukewarm water. What a beautiful, glowing skin! Pour the oils in the bottle and make a very special oil for your body. Apply it on wet skin right after the shower and dry with a towel. Just don’t be tempted to use too much of it, otherwise you will end up with oily stains on your clothes. A small quantity and some massaging will do the job just fine. Remember to shake the bottle every time before you use it, to make sure that the oils are mixed up. Add a few drops of Kardamas Extra Virgin Olive Oil in your regular body lotion for extra hydration and glow! As a great anti-aging eye serum. Forget about expensive eye products and put a couple of drops under your eye area before going to bed. Goodnight fine lines! To effectively remove make up - even waterproof make up. Apply a few drops on your face, smoothly massage it and remove it with a cotton pad. In case you run out of shaving foam/lotion. Apply some olive oil on the area and shave as usual. Its oily texture, allows the razor to flow smoothly, while it nourishes the skin and prevents irritation. No matter what your skin type is you can use Kardamas Extra Virgin Olive Oil in many ways, addressing your weekly beauty routine not in your bathroom but in your… kitchen!